I finished up my little Cathedral Window blocks the other day. Some of you guessed right. I made them into cute little pincushions. These pincushions are available in the shop. They’re so cute. I love the way they turned out. I really like the weight of them, think bean bag. You could even throw ‘em at your husband for making uncalled for “constructive criticism” about your latest project. I filled them with an abrasive to help keep those quilting pins nice and sharp. Did you know that is what the little strawberry on the tomato pincushions is for? It’s filled with an abrasive as well so when you have a dull pin you’re supposed to stick it in and out of the little strawberry a couple of times. Eh, I usually just throw away my dull pins, but it’s not very often because I’ve had an abrasive filled pincushion for years. (Usually it’s because I’ve nicked a pin with my needle while sewing *shh* don’t tell the quilt police.) So yeah, these pincushions are like a giant version of the teeny strawberry. These were such a fun quick project and just what I needed to take my mind off the Neptune quilt on my frame. Today I completed a whole row of quilting while the baby took his afternoon nap. 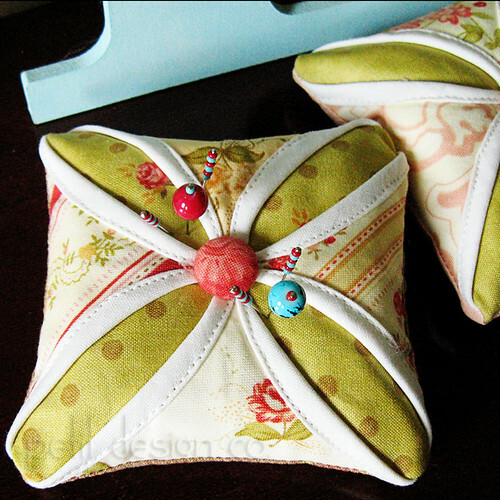 I’ve got lots of scraps hanging around so you’ll probably be seeing more pincushions in my shop. Very cute! What is this abrasive of which you speak?